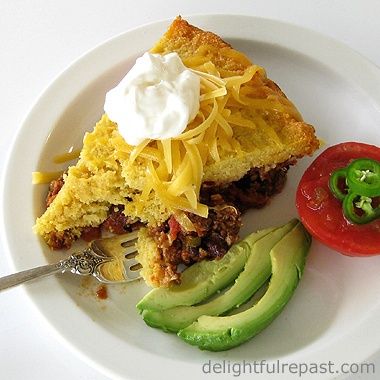 Like last week's Taco Salad, this Tamale Pie* recipe was at the request of my friend Jo. I guess as long as she stays hungry, I won't have to figure out what to write about! If you know when tamale pie was "invented," I'd like to know. I hadn't made it in years, but whenever I do, it takes me right back to my childhood. *Note to British readers: You might say it is a Mexican-influenced American shepherd's pie! My first elementary school had pretty decent food, and one of their best dishes was tamale pie. I didn't fully appreciate the quality of that school's food until I transferred to another elementary school that had horrible food. Then my junior high food was even worse because the food wasn't even made on site; it was made at the elementary school (the one with the horrible food that only got worse when it was transported across town). Of course, I use nearly all organic ingredients for my tamale pie; so it's not quite the "economy" dish my school put out. But it's so easy, and the kids as well as the adults will like it. When serving it to adults, get ready for a trip down memory lane! Another thing I like about my version is that it's baked right in the skillet. Of course, if you don't have an oven-safe skillet, you can put it in a baking dish. What was the best dish in your elementary school cafeteria? And the worst? 1 In oven-safe 12-inch slope-sided skillet (I use the All-Clad 5112 Stainless 12-Inch Fry Pan--that pan is a real workhorse, the most frequently used pan in my kitchen) or a cast-iron skillet, heat oil and cook the onion and bell pepper. I get the onion going first while I'm chopping the bell pepper. Depending on your taste and on how hot the jalapeño or serrano is, add all or part of it to the pan; you can always add more later. 2 Add the ground beef and cook, breaking it up, until very well browned. Stir in the tomato paste, chili powder, cumin, salt, pepper and oregano. Cook for a minute or so to toast the spices. Stir in the tomatoes (I use Muir Glen) and simmer for 10 minutes or so, until much of the liquid has evaporated. Remove from heat and stir in beans, olives and cheese. Taste and adjust seasoning. Smooth the top and set aside. 3 Preheat oven to 375 degrees. In medium bowl, whisk together the masa harina (I use Bob's Red Mill), baking powder and salt. In small bowl, whisk together the milk, eggs and oil or butter (I use Organic Valley). Add the milk mixture to the masa harina and beat until well mixed. It will be quite thick but should be spreadable. You might need to add 1 to 4 tablespoons more milk. Spread evenly over the meat. 4 Bake at 375 degrees for about 40 minutes. The masa harina topping will not rise high like a cornbread topping does, so don't be alarmed. I think the masa harina topping tastes more "authentic," more like a tamal (The singular of tamales is tamal, even though spell-check doesn't know that!) If you're not used to baking in a skillet, remind yourself to not touch the handle with your bare hand as you remove it from the oven and as you're serving from the pan. It's a good idea to wrap a towel around the handle and leave it there. Note: If you let it rest for a few minutes before serving, it actually can be cut into tidy wedges! And it's a simple matter to cut leftover tamale pie into wedges and reheat in microwave. I love Tamale Pie! I will try this recipe. I have a recipe I've used for years out of an old cookbook called, I Hear America Cooking by Betty Fussell. She claims the Tamale Pie was developed in Southern California during the great depression and always contains olives. Years ago Schilling sold a commercial version in a box along with their "Taco Casserole". I haven't seen them in years, but remember they had whole kernel corn in the meat. Thanks, Mark! And do let me know how it turns out for you. When I made it last month, I put in 2 cups of organic corn kernels instead of the black beans. The versions I had in childhood always had corn and no beans. But I think beans do more for me nutritionally than corn, so ... I haven't thought of Betty Fussell in ages--I'm going to look her up! I love me some tamale pie! I will try this one-pan version! Trish, thanks. Hope you'll like it as much as we do. I think of it as sort of a Mexican-influenced shepherd's pie! The thing I don't like about most tamales is that the masa is made with lard or hydrogenated shortening. And, like you say, they are labor intensive -- not difficult, but it takes a long time to make little individual things of any sort! Ole! Mexico scores again. Looks good, and I enjoy your sidebars – two kinds of men (hey, I wasn’t firmly encamped on either side of that dichotomy…uh-oh). You did get me thinking about junior high food, though. And you know, despite all my yammering against breads, my school used to serve this stale garlic toast for which I developed an absolute craving. Never been able to duplicate it. The degree of staleness, the texture, the garlic formulation, the amount and type of brush on butter – SOMEthing – was unique to that school and the Italian mothers who wo-manned the kitchen… Sigh. That looks so delicious! I might make it while the next batch of grandkids is here. I suspect that tamale pie has been around for a millennium at least. Thanks, Judy! Let me know how it turns out for you. One source said it's from the beginning of the 20th century. Another said 1911, but gave no explanation. You know in all my time I don't know if I ever ate tamale pie. I'm going to have to give this a whirl. Yeah, give it a whirl, Mrs Tuna, and let me know how you liked it! I love tamales! What a nice version on the traditional Mexican dish! Oh, how do I want to have this pie for dinner tonight! Julia, thank you! I think I'm getting ready to have it again myself! Wow, you're right! What a trip down memory lane. I don't believe I've had a tamale casserole since grade school! But I agree, it was one of their better dishes. I'm sure this recipe is much better than the cafeteria, that's for sure. I'll have to give it a go! Thanks, Richard! Be sure to let me know how it turns out for you. Hope it's another hit! Yes. McCormick® had the best Tamale Pie Kit and it had corn in a tomato/taco type flavored mix, and the corn meal,it was in a separate bag you spread evenly over the mixture and then very slowly sprinkled water over the layer of evenly scattered corn meal. It was light & spongey. Not like corn bread, not like corn bread at all. I remember I would get in a hurry because (I think it was like a half cup or third cup of water) and sprinkling it was a challenge so as not to get too much in one spot and make a hole through to the sauce. Haha 😂😂anyway it would bubble up a bit of sauce anyway atop the meal and it was soooooo great. It even came with it's own tiny can of crisp corn. "Just add hamburger" Ahh the 70's & 80's Oh I loved it so much! (there were no beans or black olives) it was always served with mashed potatoes in our home, and a salad. Yumm hmmm hmmm hmmm Yumm!! The good old days!! I wonder why they stopped making that glorious kit! ! Yes! I'm going to try it! Thank you so much. Sheila, thank you for sharing your tamale pie story--I love it! When you try this, do come back and tell me how it turned out for you.